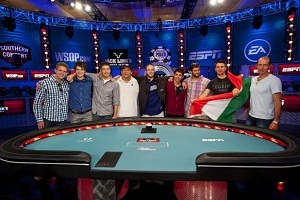 Like the 2011 World Series of Poker Main Event final table, the nine players who reached the final table of the 2012 WSOP Main Event showed why they had made it this far in the tournament on Monday night. With only a few really questionable plays, the level of play was very high throughout the proceedings on Monday as the October Nine played down to the final three –who will return to the Penn & Teller Theater at the Rio on Tuesday at 9 PM EST. Steve Gee’s elimination at the hands of Russell Thomas will likely be viewed as a “bad” play when viewed in a vacuum, but the fact is that his all-in bet nearly worked, and had Thomas held a hand just a pip less in strength it would have worked. With the board reading 457-J-3, Gee, who had bet every street and been called by Thomas the whole way, moved all-in, representing a 6. Even though the bet made little sense it was still a tough call for Thomas, as calling and losing would have crippled him. In the end Thomas called with Pocket Queens while Gee flipped-over Pocket 8’s. The polarizing Rob Salaburu was the next out, hitting the rail not long after running pocket Queens into the pocket Kings of Jacob Balsiger, which took a huge chunk out of his stack. Salaburu called Jesse Sylvia’s Small Blind all-in shove of Q5 with pocket 7’s and looked to be in good shape to double through until Sylvia binked a Queen on the river. After letting his stack dwindle to a near inconsequential amount Michael Esposito FINALLY stopped calling and started shoving over the top –something he did three hands in a row—but ran an AJ into Greg Merson’s AK and fell in 7th place. The one real “blowup” of the night was the Hungarian and former WPT LA Poker Classic champion Andras Koroknai. Koroknai started the night as the tightest player but started getting aggressive a few hours into the final table, perhaps trying to capitalize on the image he built. After building his stack up to 40 million, Koroknai picked a bad spot to ramp up his aggression to an even higher level, five-betting all-in with KQ and running into Greg Merson’s AK. Ausmus was calm, cool, and collected throughout the final table despite being the short-stack, and had he managed a double-up at some point could have been a factor. As it was, Ausmus went out in 5th place after shoving his T7 on an 8933 board and getting called by the A9 of Jesse Sylvia. The final elimination of the night was Russell Thomas who chipped-up early but couldn’t sustain the momentum. After watching his stack dwindle Thomas shoved with A9 and was called by Jacob Balsiger’s AK, setting-up a very interesting three-handed match tonight.